Interpreting the Prophetic Books, Gary V. Smith. Grand Rapids: Kregel Academic, 2014. Summary: This is a concise guide for those preaching from Old Testament prophetic texts covering issues of genre, themes, interpretation, preaching, and contemporary application. This summer, I’ve been part of a preaching team covering a number of the shorter books in the Bible one book per Sunday, including the Minor Prophets. My assignment has been the books of Nahum and Habakkuk. This is a challenging task if you are not a specialist in this area and some distance from your seminary classes! Distinguishing between near and distant fulfillment, understanding the setting, recognizing different genres within prophecy, and moving from the meaning of the text to relevant application for an audience separated by over two millenia and a cultural gap are all issues that face anyone working with these biblical texts. Chapter 1. The Nature of Prophetic Literature: Temporal categories of present, future, and apocalyptic, genres of prophecy, and poetic elements including parallelism and imagery. Chapter 2. Major Themes in the Prophetic Books: Themes running through the prophets, and themes by specific books. Chapter 3. Preparing for Interpretation: Knowing the setting of the pre-exilic prophets to Israel and Judah, the exilic prophets, and the post-exilic prophets, issues to be aware of in Ancient Near East Prophecy, textual criticism, and the use of commentaries, including recommendations of commentaries by book (conservative to mainstream Western scholarship). Chapter 4. Interpretive issues in Prophetic Texts: Literal vs. metaphorical, contextual limits, conditional or unconditional, near or far future, and prophecy and its New Testament fulfillment. Chapter 5. Proclaiming Prophetic Texts: Getting oriented, shaping the presentation, determining the principle, and reflecting on the application. Chapter 6. From Text to Application: Offers examples of the steps of Chapter 5 with reference to near future and distant future prophecy. The book concludes with a glossary of terms relevant to interpreting the prophetic books. 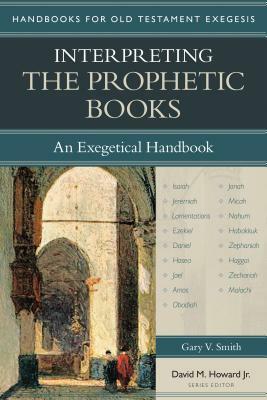 The organization of the book follows good principles of biblical exegesis and provides pointers to the most common exegetical and interpretive issues that arise in handling the prophetic material. There is a brief and then more detailed table of contents that allows one to consult material relevant to a particular prophetic text. The author provides examples from scripture throughout to illustrate points. And the examples in Chapter 6 illustrate the process and care involved in putting together a message that is both exegetically sound and appropriate for one’s audience. If there was any criticism that could be made of this book, it would be the very limited attention (six pages) given to prophecy and New Testament fulfillment, and particularly, to Christological interpretation. It may be that the author decided to defer to other texts that give greater attention to these matters but given that this is written for use by pastors of Christian churches, a fuller treatment might have been helpful. On the whole, however, this is a valuable work that serves as a helpful review for those who have had seminary-level training in prophetic exegesis, and a valuable and accessible primer for those without such training. It is a very complex topic and an the issues covered by the author are the ignored ones in many sermons and teachings that I have attended. It sounds like a well thought out book that missed what most people would expect to read on. Christ’s coming the first time was well prophesized and one of the most important events for humanity. Christ’s second coming is in the near future but still shrouded by mystery. If all the religious scholars got the Christ’s first coming wrong then I am of the belief that they will not accurately predict his second coming well. Scripture tells us to keep reading and to be alert to this prediction. It is important to keep ones mind on the unexpected. God doesn’t think like us and he never will and that makes life exciting.